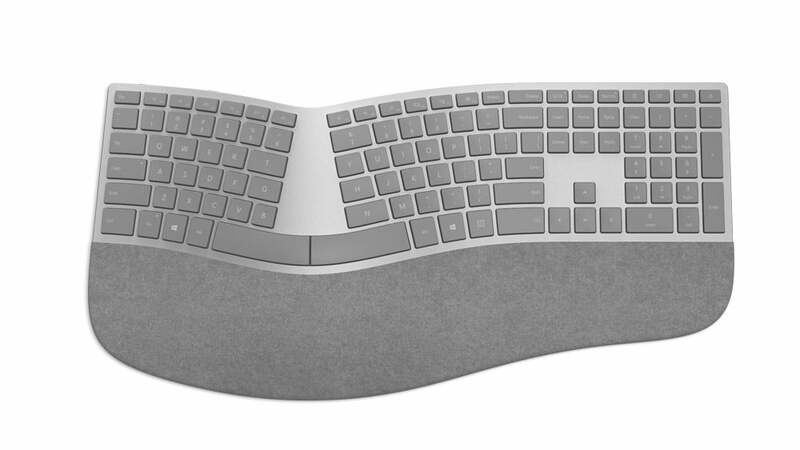 Microsoft announced some interesting products at the Surface event like the Surface Studio and the Surface Dial – but here’s something a little more normal: Surface Ergonomic Keyboard. The keyboard features an ergonomic design and comes with a unique palm rest built out of Alcantara fabric. The palm rest is the interesting bit – it’s even double cushioned to make sure the typist’s hands stay comfortable while using this keyboard. The Alcantara fabric is usually found in cars – on the seats, specifically. This ultra-durable version of Alcantara is supposed to provide a decent amount of cushioning and hence make the keyboard much more comfortable while typing for an extended period. Microsoft is using the same key switches for this keyboard as found on its Surface keyboard covers – but the travel distance is 2.5mm higher than the Surface keyboard covers. The extra depth helps keep the keystrokes silent and feel satisfying. The keys are not all the same size either – that’s because the keyboard has a beautiful arch to it, which is what makes it ergonomic to use. The keys get larger as the arch gets closer, to compliment the keyboard’s shape. For connectivity, the keyboard uses Bluetooth Low Energy 4.0/4.1 – it can, therefore, work with any device that supports a Bluetooth keyboard. The Bluetooth connection has a range of as far as 10 meters, and because of the latest Bluetooth Low Energy spec,; the battery life delivered is a whopping 12 months. Microsoft plans to start selling this accessory starting from 21st November 2016, but you can go ahead and pre-order it today for just $129.99. It is finally good to watch Microsoft focus on ergonomics and beauty in their products which is something they lacked up until the very recent few years.